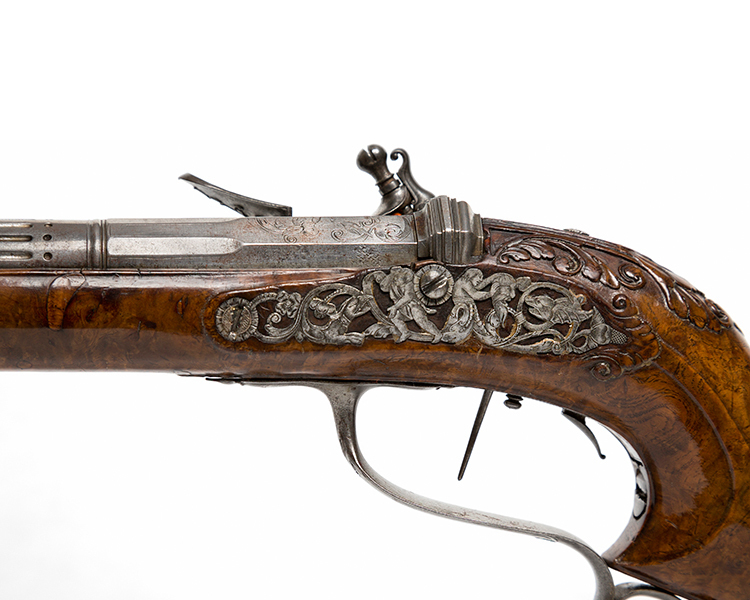 A magnificent and extremely rare rifle made strictly for target shooting, by Cloistre a Grenoble. The 27 3/4" beautifully formed and multi-grooved rifled barrel of .45 cal. is set into a three-quarter stock of highly figured grenoble walnut, which is richly carved at the fore-end, around the tang and at the tail of the lock. Signed on the finely engraved lock and barrel and with engraved and pierced side-plate. Due to the diminutive size, 40" overall, it may be speculated that this fine rifle, provided with a double set trigger, was made for a child of privilege to use in competition.